Can a Locksmith protect you from thieves or break-ins? | Metro Lock & Safe Inc.
Posted on November 3rd, 2017 by Metro Lock & Safe Inc.
Locksmiths let you in; can they keep others out too? Practically everyone has either dealt with a locksmith personally, been with someone who has, or at least knows a story of how a locksmith came to a friend’s rescue. A quality locksmith works like a modern-day hero, coming to help those in distress in their time of need. Lockouts aren’t only inconvenient; they can be dangerous too. And if you’re locked out of your car in an unfamiliar area, it’s understandable to get a bit edgy. But if a locksmith can get you into your house, can they also keep others out? If you have a versatile locksmith, they certainly can! A trained lock expert can help protect you from at least seven types of thieves(**), each more trouble than the last: Sneaky, Creaky, Weaky, Geeky, Creepy, Cheeky, and Duane. (* *)These are by no means official! A sneaky thief is your basic opportunist. Often, they steal impulsively when an opportunity presents itself. They may also notice if you’re packing up your car and preparing to go on vacation. Sneaky thieves don’t break into your house; instead, they get in through unlocked entrances. This could be a back door, a 2nd-floor window, or any other entrance you may have forgotten to check. A sneaky thief may try the credit card trick to get in, but won’t break your door or hinges. 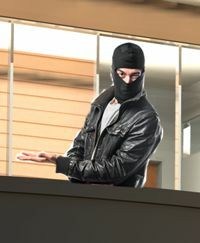 Combatting sneaky thieves is simple; double check all ways into your property whenever you leave. If your door is prone to an old trick like getting in with a credit card, your locksmith can help by updating your door locks to ones that don’t have that exploit. Creaky thieves are okay with making a little bit of noise to get in, but they still don’t want to get caught. These are the type of thieves that use crowbars to force open windows or may break the lock if they have an opportunity. They typically target homes that appear to have high-value objects but minimal security. 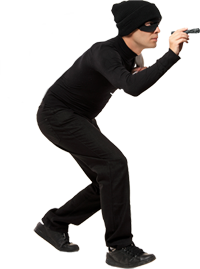 A creaky thief searches for doors and windows that can be opened with relative ease as they want to sneak in, take what they want, and get out. If caught, they tend to search for escape and avoid confrontation. Having a strong door lock can sometimes be enough to stop them, but not always. If your door framework is old and weak, they may be able to find a way in. 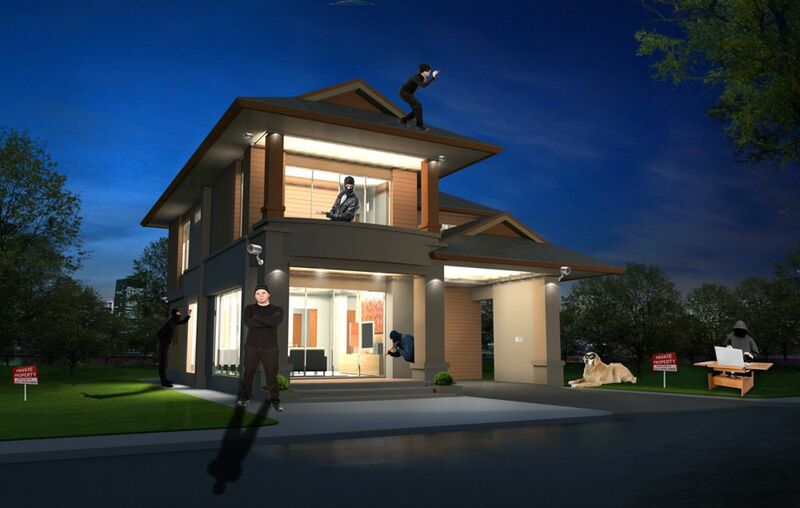 An alarm system is a strong deterrent to keep creaky thieves away. But what if you don’t have one? A temporary solution is to make it appear like you have one until you can actually get a system installed. A generic home protection sign and a couple of fake cameras should be enough; at least for a little while! Contrary to the name, weaky thieves aren’t a group that you want to mess with. Also known as robbers, they aren’t technically thieves, because they do don’t sneak in and take your belongings. 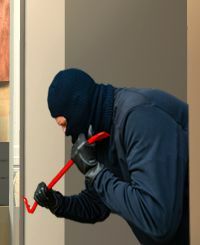 Weaky thieves may work in small groups and often decide on a house they want to target, and set a date to do it whether or not the person is home. This kind of “thief” isn’t afraid of a confrontation, and may verbally threaten occupants or even bring weapons to get them to comply. As they typically break down the door or window, they may not even wear a mask to hide their identity. However, while they may be belligerent and seem dangerous, they rarely actually want to hurt anyone and prefer to just get what they came for and leave. Because they may decide to simply bust through a window and get in, a basic locking system won’t be enough. A modern alarm system can help though. Some even allow for remote access, giving you the ability to monitor your house or call in an alert from a distance. Higher-grade systems often promise a higher response time and may be able to catch these criminals in the act. You aren’t likely to encounter geeky thieves at your home, but that doesn’t mean they can’t steal from you. This kind of thief prefers to operate from a distance and stay in the shadows. Typically, they’ll try to take your credit cards or bank account information, giving you a headache to deal with to get your money back; if you even can. While you are very unlikely to deal with a geeky thief at a residence, that doesn’t mean it never happens. These thieves learn tricks such as how to hack a garage door, and the more advanced ones can even make your home security system stop working. However, these kinds of tricks take a high level of technical knowledge and exploits are consistently being patched by security companies. To make sure that geeky thieves have no chance getting into your home, you can make sure your garage door technology is up to date and combine that with an advanced access control system. As these can be costly to purchase and maintain, your local locksmith or security company can help you decide if it’s a smart choice for you. What makes a thief creepy? When you get something stolen from you and you don’t even know it. That’s the method creepy thieves rely on. These are the scammers of the world, and they infiltrate nearly every business that there is. They can look like anyone else and don’t wear a mask, but we all know their true form. Scammers rely on wily wordplay and false promises, and their goal is to have you let your guard down so they can sneak past your defenses. Locksmithing is one of the most common industries to find creepy thieves. They can trick you by advertising impossibly low prices and raising them when the work is done, pretend to be local and refer to you a distant call center, or even put locks on your door and keep a spare key for themselves. 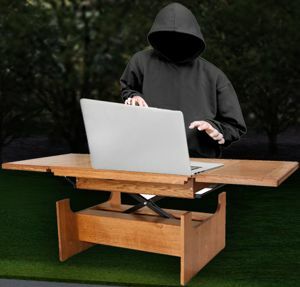 The best way to defend yourself against creepy thieves is to be on alert. Get to know your local locksmith. Be on the lookout for deals that are too good to be true. And take a few minutes to check reviews to find a quality locksmith instead of the closest one, as this can save you money and time. A thief that’s hard to catch is one that’s invited in. And that’s exactly what’s going on when you deal with cheeky thieves. A cheeky thief tends to be someone you know, often a former acquaintance or employee. These kinds of thieves often don’t plan on stealing anything. But over time, they feel like they are wronged or cheated and decide to steal to get back at someone. Many times, they take what they want and not only let you know about it, but they gloat and rub it in when they do it and disappear from your lives. One of the most common kinds of cheeky thieves are disgruntled employees. This can be someone that thinks they aren’t treated fairly or believes they were punished or fired unjustly. They wait until quitting time to take items or information from the company and then disappear. Often, the items they take with them are insignificant and aren’t worth chasing them down. But this isn’t always the case. Sometimes, former employees leave with client information, trade secrets, or ways to exploit a loophole to steal money. Some reported thefts from upset employees have been over a hundred thousand dollars! If you’re dealing with an employee like this, a safe option is to rekey your locks, especially after a major confrontation. This will stop them coming in a month later and taking what they please. Surely though, most people don’t take from the company, even if they were laid off unfairly, do they? The statistics may surprise you! Poor Duane is a good boy that didn’t know what he was getting into. He didn’t know the bad people wanted to take from others. Duane actually likes sharing. And instead of being a helpful member of a thieving crew, Duane is far more likely to compromise the plan by accident by making loud noises or not having dark colors. In fact, some people would even consider you lucky if someone like Duane came to their home!